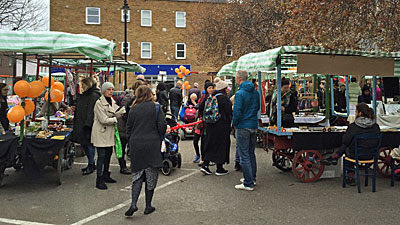 A new market has opened on Roman Road, E3. It's called the Yard Market and it will take place every Saturday. They may say 'yard' but what they really mean is car park. You can park in the car park on the corner of St Stephen's Road in the week, but you can no longer park here on Saturdays because there are stalls. The Yard Market is not like the normal market. 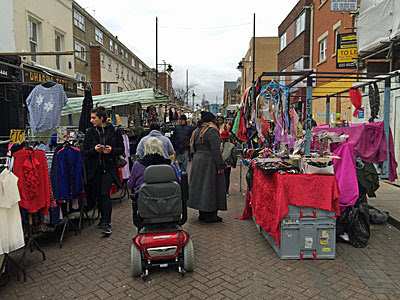 The normal market on Roman Road sells clothes and 'fashion' at knock-down prices from stalls all the way along the street. You can buy dresses and cardies and jumpers and shoes and handbags and that sort of thing. It is just possible that some of the clothes with labels are not entirely legit. The Yard Market is different. It will sell Vintage and Collectables and Mid-Century and Unique Wares and Handmade and Designer and Local. Essentially it sells stuff you don't need, but is quite nice to have. You get a completely different type of stallholder at the Yard Market. And a completely different kind of punter. Yesterday they held a Launch Party for the Yard Market. I got a leaflet through my letterbox and I live a good mile away. It started at eleven o'clock. 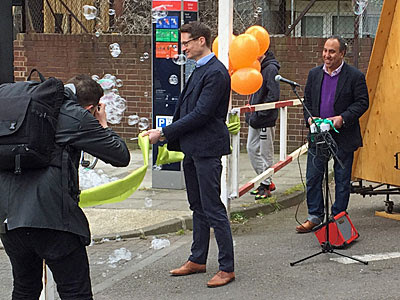 A local councillor turned up and cut a ribbon tied across the entrance to the car park. A small crowd cheered and some photographers tried to capture the ideal shot. Because it was the first day there was street entertainment. Two men with buckets of soapy water made hundreds of bubbles. This kept small children and the photographers very happy. Some buskers stood on a mat and played music. And two costumed superheroes made balloon animals, because obviously that's what superheroes do. A lot of the things for sale had been made by the people selling them. There were brightly coloured yoga bags and African baskets. There were vinyl albums from the 1980s and old maps. There were eye cushions and handmade quilts. There were queer t-shirt designs and art featuring bicycles. There were no polyester blouses. Altogether there were nearly a couple of dozen stalls. It only took a few minutes to walk around, just as it would only take a few minutes to walk round a small car park. But it took longer to walk round if you stopped and looked at everything. All in all it was a promising start for the Yard Market. A decent number of people had turned up for the opening. Some were people who normally came to the market, looking around to see what the new market had. They walked round the stalls, or rode on their mobility scooters. They didn't buy much because they don't need bath bombs or E3 t-shirts or cacti in designer pots. Other visitors wouldn't have been seen dead on the old market. They were smarter dressed, younger and less ethnically diverse. They came to see the special things, not the everyday things. I spotted the young thrusting project manager from work and his fiancé, who recently moved in round the corner. I was not surprised to see them here. 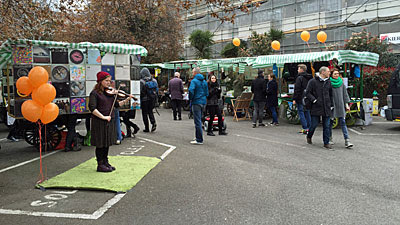 Three food vans turned up to give the Yard Market some bite. One sold buttermilk chicken burgers with bacon jam. One sold beef rendang and Malaysian noodle salad. The third sold grilled cheese, notably Queso Chihuahua, Chorizo and Rocket for £6.50. They don't normally sell posh grilled cheese down Roman Road. But they sold out by 3pm. Mary Portas would have been delighted by the Yard Market. She came to Roman Road a few years back to give it an economic kick up the backside, and this is just the sort of project she'd have liked. As it is, the only remnant of her time here appears to be the pop-up streetfood bakery on the corner. They sell three-bite lemon tarts for £3.50. Because this was the launch party there were also some special events. Several free guided walks were on offer, including one for history, one for indie shops and one for lost boozers. These added genuine cultural depth, emphasising that the Yard Market is a community enterprise at heart. There will not be free walks next Saturday. There was supposedly an additional Fresh Food Market starting this week. The weekday stallholders insisted that this was housed in their part of the market, so that not all of their trade leached away to the upstart across the road. So far as I could tell the Fresh Food Market contained only two stalls. They needn't have bothered. And the normal market remained busy. Ladies who want cheap dresses and furry boots or colourful handbags already know where to come. And the traders know their business, keeping prices at rock bottom to shift as much gear as possible. In the normal market you can buy a dress for a quid or leggings for a fiver, indeed an entire outfit for less than a single Yard Market item. 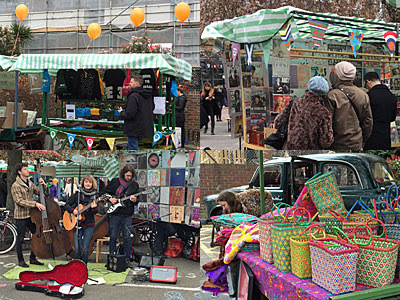 Viewed one way the Yard Market is a great addition to Roman Road's retail offering. A triumph of diversification, it offers quality and originality, augmenting and complementing the original market. Neither market particularly competes with the other - you'll come for one or you'll come for the other. Viewed another way the Yard Market is a telling sign of the changing post-Olympic East End. A kind of middle class annexe, it offers quirk and character for the trendier incomers, but very little for the poorer long term locals. You're either a polyester blouse person or a grilled chorizo person - so pick your market, and come buy.